It wasn't deafening -- but it was loud enough to pretty much push all the other sounds of the world into the background. Initially the sources were invisible, but, after a little thought and a quick chat with Mars, the mystery was quickly solved. 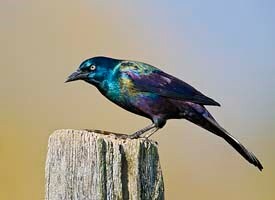 It is migration season for the grackles -- those glossy black birds, with shiny purple heads, penetrating yellow eyes, and annoying crow-wannabe voices. They are short-distance travelers, so grackles from the far-northern U.S., Canada, and the Great Plains winter in the central and southern U.S. And on their way from Maine to Delaware they spend a few days with us in central Connecticut. Mars and I hosted them earlier in the week -- wave after wave of inky invaders, hundreds of them, cascading into our yard -- then across the road into our neighbor's -- then up the street a few houses... On the ground they moved swiftly across the lawns like a band of well-choreographed groundskeepers, vacuuming the lawn clean of seeds and acorns -- the foods of choice for these migrating marauders. And they sing badly, and all at once - but never in unison. Their solo "song" has been commonly described as sounding like the swinging of a rusty gate. Chorally they make a noise more akin to the electronic background music for the massacre scene in a low-budget scary movie. I gazed up and saw nothing except masses of brown-tipped, but still mostly green, lobed leaves. Then I heard a "ping" near my feet and looked down in time to see an acorn moving away from me with decreasingly high bounces. Then another oak fruit passed downward past my eyes. And another. I glanced up again and saw nothing other than the occasional falling acorn, so I momentarily convinced myself that it was the avalanche of plummeting nuts hitting the dry leaves that I was hearing. The din accompanied me all the way home where, I called Mars outside to listen. "It's the grackles," she said as we both spotted a flock of them alighting en masse atop the wildly swaying branches of a neighboring oak tree. But from where we stood we could also hear the percussive beat of the acorns on the Tarmac -- the combined result of end-of-the season fruit dispersal and annual avian disruption. "We Survived the Grack' Attack of 2010" tee shirts will soon be available at a website near you.